In a scene from Spider-Man: Homecoming, Tony Stark is shown to be attending a ceremony, very possibly a wedding ceremony, in what looks like India. (I'm Indian, I would know). Now, Tony Stark is obviously a very busy man. It seems like someone would be very important to him in order for him to fly halfway around the world to simply attend a wedding. Admittedly, I haven't read a lot of Iron Man comics, but the ones I have never featured an Indian character, let alone someone that close to Tony. An alternative explanation would be that the attending a wedding ceremony is a cover for some Avengers business, but again I'm drawing a blank on possible allies or enemies canonically located in India according to the MCU. Bruce Banner did mention that he was in Calcutta back in Avengers, but that tenuous connection is all I can think of. So why exactly would Tony Stark attend an Indian wedding? Is there something in the comics which would provide a clue? “So where are you?” I asked, looking around suspiciously. I half expected to see a drone in the sky spying on me. It doesn't mention whether he has an ulterior motive for flying half-way around the world but I think we can assume that he's not just there for his (mental) health. There is probably no in-universe explanation to this. I suspect the scene was slyly placed in the movie as a pleasant Easter egg for Indian viewers to discover, a kiss blown in their direction, rather than as a more aggressive attempt to pander to them. I’ve come to this conclusion because when I inquired with Sony Pictures Entertainment, India, as to why the Indian scene was included in the film, they simply referred me to the L.A.-based executives at Sony and Marvel. I assume they hadn't been advised of the thinking behind that particular decision. Homecoming producer Kevin Feige made reference to the scene during an interview last year, but he didn’t go to the trouble of explaining the reason for it. Whatever the studios' intent, Indian audiences have given the new picture a hearty welcome, with a 41.7 crore rupees / $6.45 million opening weekend that established a new record for Sony Pictures' India releases. 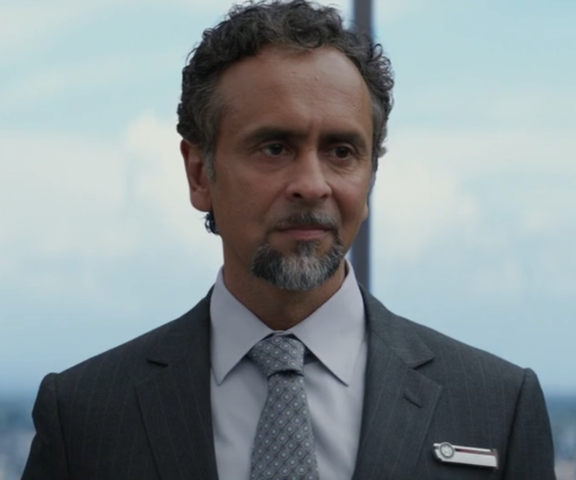 In-universe, there was a powerful Indian character in the MCU. This guy was a member of World Security Council. Wikia says his name is Nagendra Singh (which is an Indian name), but I don't think his name was ever mentioned. Talking about his nationality, we have hints. Considering this attack took place one mile from my country’s sovereign waters, it’s a bit more than that. I move for immediate hearing. The International Waters here belongs to Indian Ocean. So, it narrows down to few countries like India, Sri Lanka, Australia, Egypt etc. Let me ask you a question: what if Pakistan marched into Mumbai tomorrow, and you knew the they were going to drag your daughters into a soccer stadium for execution. And you could just stop it, with the flick of a switch, wouldn't you? Wouldn't you all? It tells with 99% probability that his nationality is Indian. Or, at least, his origin is India. Although, this guy is dead now, it is possible that Tony Stark developed a close relationship with his family. It could be because Flash (Peter Parker's rude, bullying high-school "nemesis") seems to be Indian, and they've added Tony's visit to balance out the negative portrayal of an Indian character? While there's no official in-universe reasoning that I can find (and out-of-universe reasoning for the scene is discussed in other answers), there could be a perfectly logical in-universe reason for him to be there: he was invited! He need not be terribly close to the person involved. The invitation could have been extended as a courtesy among colleagues, and he thought it would be fun to attend, or he could be funding the celebration in a random act of generosity; neither of these things is out of character for Tony. What if Stark was trying to look into activities related to Dr. Strange? Given the setting, it appears to be a wedding located in India. However getting from India to Nepal (where Kamar Taj is) isn't all that difficult. It's a decent enough cover not to raise any suspicions. And we know that Dr. Strange will be in both Thor 3 and Avengers 3. Not the answer you're looking for? Browse other questions tagged marvel marvel-cinematic-universe iron-man spider-man-homecoming or ask your own question. Why doesn't Tony Stark lose a leg? Why have Tony Stark killed? Why did Tony Stark use an electromagnet? Is Tony Stark an atheist? Where was Tony Stark born? How could Vulture see cloaked jet of Tony Stark? What did Tony Stark say to the press? Why is there a lady putting flowers on Tony Stark in India? What did Tony Stark mean by this?